In September we wrote an article about the particulars of speaker enclosures and how they affect the sound of a cabinet (read here).This month, we’d like to focus on the intricacies of the speakers themselves and their components. A good speaker can be the difference between and awesome tone and a lousy one. But it’s not always that simple; a speaker that sounds good in combination with a certain amp and guitar will not necessarily sound great with every amp and guitar. 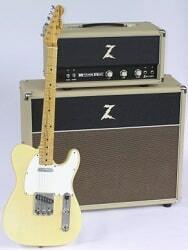 There are several factors that need to be considered when attempting to achieve the perfect balance between a guitar, an amp and a speaker. For one thing, there’s the relationship between the wattage and the efficiency of a speaker and the amplifier that’s feeding it power. If you’re going for a very clean sound, you want your speaker to be able to handle all the power that your amp can give it and then some. If your amp is more powerful than your speaker’s power-handling capability, the speaker will be pushed to its limit, adding distortion to your sound. A good way to demonstrate this would be to take a 100-watt amp and plug it into a 100-watt cabinet and then into a 200-watt cabinet. The 100-watt cab will sound more distorted than the 200-watt cab because the speakers in the 100-watt will be pushed closer to their maximum capability, resulting in distortion. That’s why many players favor lower-wattage speakers driven to distortion by powerful amps. Now let’s take a look at the parts of a speaker. The magnet contributes heavily to a speaker’s overall tone. 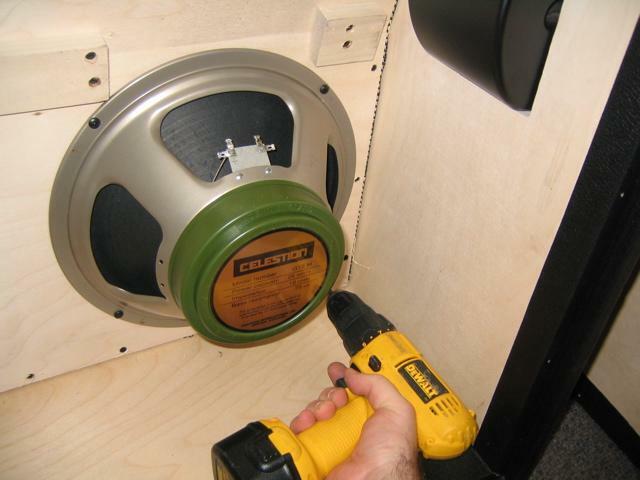 The most common types of magnets found in guitar speakers are ceramic and alnico. 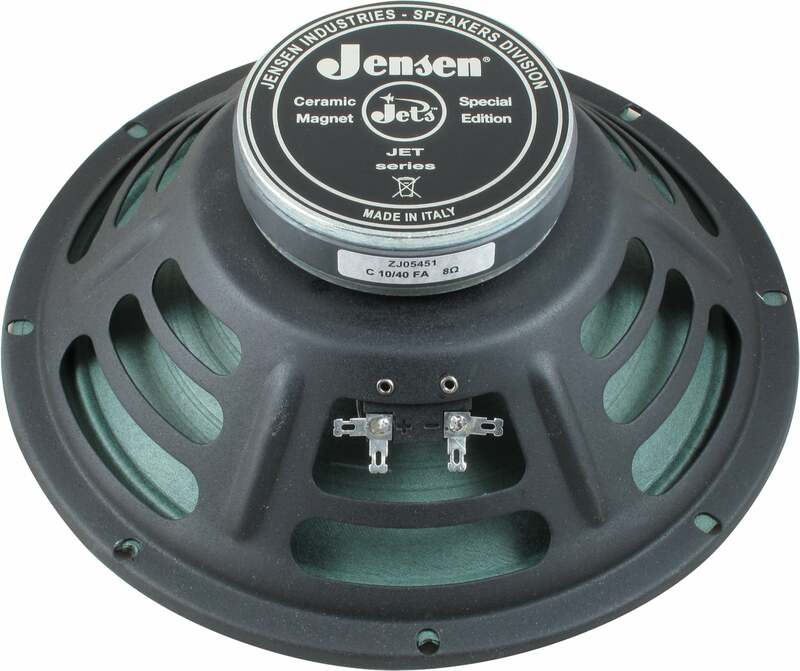 The very popular Celestion 25-watt “greenback” has a ceramic magnet and, although it has less of a focused field of energy, it has its own character and a very cool sound. On the other hand, the highly acclaimed blue-colored Vox bulldog speakers, as well as some JBL and Electro-Voice (EV) speakers, use alnico magnets. Alnico magnets also have their own sound and character which, to my ears, is a little more focused. Guitar speaker cones are made out of paper. When people refer to ‘vintage style cones,’ they’re talking about very simple, low-tech, flat paper cones. As guitar sounds evolved over the 40 years, some speaker manufacturers incorporated more intricate cone designs by introducing ripples and ridges with the goal being better rigidity and stability at higher power to stave off distortion. The voice coil is attached to the cone at the center of the speaker. It is here that the speaker goes from being an electronic device to an acoustic device. The coil is an actual coil of wire with connectors at each end that connect to the output of the amplifier. Think of the speaker as a loop with positive and negative designations, since that’s how it’s connected to the amplifier. When you play, the output of the amplifier sends a signal to the speaker which causes it to push out. When you cease playing, the output of the amplifier pulls the speaker back in. The reason that speakers are labeled positive and negative is so they can be polarized amongst other speakers without being out of phase. The housing in which all of these components are mounted is called the frame or the basket. The majority of frames are made by stamping flat sheet of steel and bending it into its final shape. Steel is used because it’s relatively inexpensive and very strong, which is important so that its shape doesn’t change. Some high-end speakers use what’s known as a cast frame or speaker basket. Cast frames are made by pouring molten aluminum or a similar allow into a cast. When the alloy cools off and hardens, it’s almost impossible to distort or alter the shape of the frame, which makes it an optimal mounting for the components of a speaker. No discussion of speakers could be complete without including some mention of impedances. What I’ve come to learn over the years is that the impedance of a speaker is an arbitrary decision made by the manufacture. Leo Fender, for example, was really only making amplifiers with one or two speakers and decided that, with one speaker connected, it would be eight ohms, and with two in parallel, it would be four ohms—while taking into consideration that eight ohm efficiency is an audio amplifier is most efficient for direct music input. In contrast, the British giants like Vox and Marshall pursued greater versatility in combinations of speaker hookups and settled at 16 ohms to facilitate their needs. Just make sure the impedance on your amp matches your cabinet(s). Guitar Amps 101 – Speakers: Does Size Really Matter? IN YOUR DISCUSSION OF SPEAKERS ABOVE YOU STATE THAT WHEN YOU PLAY THE GUITAR THE SPEAKER CONE IS “PUSHED OUT” AND WHEN YOU STOP, THE CONE IS “PUSHED BACK IN”. I FIND THIS TO BE MISLEADING AT THE LEAST. WHEN THE AMPLIFIER SENDS A SIGNAL TO THE SPEAKER, IT IS AN ALTERNATING CURRENT SIGNAL, AND CAUSES THE CONE TO MOVE FORWARD AND BACK WITH THE FREQUENCY OF THAT SIGNAL. THE CONE MOVES FORWARD AND BACK AS LONG AS THERE IS A SIGNAL SENT TO IT. YOU ALSO STATED THAT THE ALNICO MAGNET IS “A LITTLE MORE FOCUSED”. ACTUALLY THE ALNICO SPEAKER SOUNDS BETTER TO SOME BECAUSE IT IS NOT AS EFFICIENT, AND ACTUALLY GETS LESS FOCUSED OVER TIME BECAUSE IT IS NOT A PERNANENT MAGNET AND IT DETERIORATES OVER A PERIOD OF YEARS. I’VE HEARD OF SOME PEOPLE ACTUALLY TRYING TO “AGE” THE ALNICO SPEAKERS BY ABUSING THE MAGNETS WITH A MALLET OR HAMMER. OLD, NATURALLY AGED ALNICO SPEAKERS ARE VERY HARD TO FIND, AND EXPENSIVE, BUT I WON’T BE USING A HAMMER TO AGE MINE. MAKE SURE YOU WRITE IN ALL CAPS. IT ISN’T ANNOYING IN THE SLIGHTEST. THANKS FOR YOUR PERMISSION. I’VE BEEN SO CONCERNED AND LOOSING SLEEP OVER THE MATTER FOR DAYS. THANK YOU FOR THE ENCOURAGEMENT AND FRIENDLY RESPONCE.